“There is no religion, no doctrine higher than brotherhood and sisterhood.” Thay (teacher) Nhat Hanh. 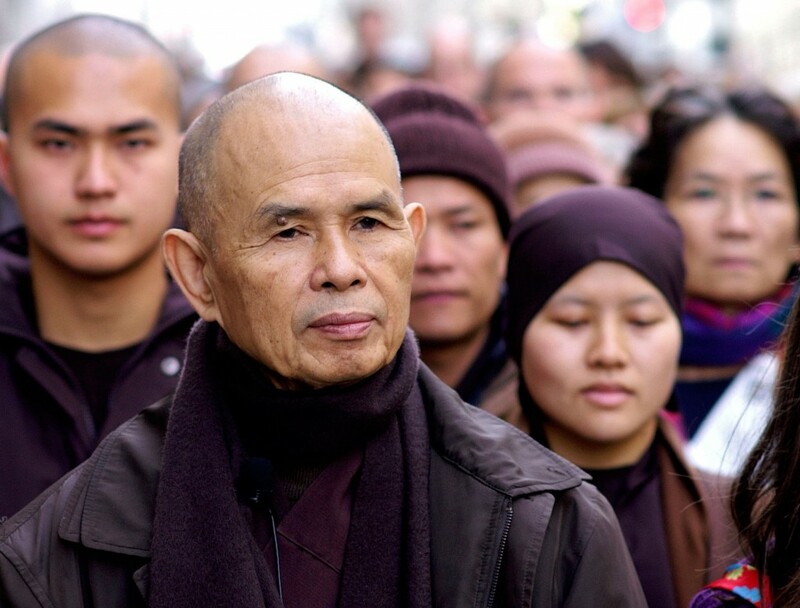 Andrea Miller’s exclusive interview with Thich Nhat Hanh. Thich Nhat Hanh. Photo by Duc. It is very painful when someone we love has serious difficulties, such as mental illness, post-traumatic stress disorder, or addiction. Sometimes it feels like their problems are so big that we can’t really help them and so we may want to retreat from them and their problems. At other times, we try to help, and then get consumed by the other person’s struggles. What can we do to help in these difficult situations without getting overwhelmed? When you feel overwhelmed, you’re trying too hard. That kind of energy does not help the other person and it does not help you. You should not be too eager to help right away. There are two things: to be and to do. Don’t think too much about to do—to be is first. To be peace. To be joy. To be happiness. And then to do joy, to do happiness—on the basis of being. So first you have to focus on the practice of being. Being fresh. Being peaceful. Being attentive. Being generous. Being compassionate. This is the basic practice. It’s like if the other person is sitting at the foot of a tree. The tree does not do anything, but the tree is fresh and alive. When you are like that tree, sending out waves of freshness, you help to calm down the suffering in the other person. If I’m feeling a very difficult emotion, maybe anger, or deep sadness, and I try to focus on my breath, isn’t that a way of avoiding my emotions? Usually people lose themselves in a strong emotion and become overwhelmed. That is not the way to handle emotion, because when that happens you are a victim of emotion. In order not to become a victim, breathe and retain your calm, and you will experience the insight that an emotion is only an emotion, nothing more. This insight is very important, because then you are no longer afraid. You are calm, you are not trying to run away, and you can deal better with emotion. Your breath is you, and you need alliance with your breath to be more of yourself, to be stronger. Then you can handle your emotion better. You do not try to forget your emotion; instead you try to be more of yourself, so that you are solid enough to deal with it. It was heartwarming to see so many children at the retreat. I feel comfortable with children. I have never been cut off from the younger generation. Whether they are monastic or lay, communication is always “on” with the younger generation. That is one of the elements of my happiness. Sometimes young mothers bring their children into the meditation hall because they don’t want to miss the dharma talk. That’s very nourishing for everyone. The babies don’t know what’s happening, but they feel the peaceful atmosphere. That energy of peace is rare in society—it’s very rare to have fifteen hundred people sitting and producing mindfulness and peace. If you offer children a glimpse of peace and love, even if they are very small and they don’t know language yet, that does not mean that they don’t feel it. Try to imagine a young mother feeding her baby during the retreat. She is listening to the dharma, she’s consuming the dharma, and the baby is consuming both the milk and the dharma at the same time. It’s very beautiful. Later on, when the children encounter the cruelty in the world, they will remember that there was a time when they had the opportunity to encounter the energy of peace. When a sangha, a Buddhist community, comes together and practices, it can always produce that kind of peaceful energy, and young people can experience it and start planting the seeds for the future. Engaged Buddhism tries to bring this peaceful energy into many different situations. In schools, in hospitals, in town halls, in congress, the practice of mindful breathing is possible. Is living in the present moment at odds with enjoying the media? Can we be mindful and still enjoy the internet and TV and movies and books? There are good books and movies that you can enjoy. That’s okay—it’s good to enjoy them. But sometimes the quality of the film or book is not good at all, yet you don’t turn it off because if you do, you will have to go back and experience the suffering inside you. That is the practice of many people in our society. Many people cannot be with themselves. They have pain, sorrow, or worries inside, and they read or watch or listen to cover this up, to run away from themselves. Consuming media like that is just running away and it doesn’t have a lasting effect. You can forget your suffering for some time, but eventually you have to go back to yourself. The Buddha recommended that we should not try to run away from ourselves, but learn to take good care of ourselves and transform our suffering. What would you say to someone who finds sitting meditation painful and difficult and they struggle to do it? Yes, yes. If you don’t find it pleasant to sit, don’t sit. You have to learn the correct spirit of sitting. If you make a lot of effort when you sit, you become tense and that creates pain all over your body. Sitting should be pleasant. When you turn on the television in your living room, you can sit for hours without suffering. Yet when you sit for meditation, you suffer. Why? Because you struggle. You want to succeed in your meditation, and so you fight. When you are watching television you don’t fight. You have to learn how to sit without fighting. If you know how to sit like that, sitting is very pleasant. You put a lot more emphasis on enjoyment—on enjoying breathing, sitting, walking, enjoying life altogether—than many other Buddhist teachers do. In the teachings of the Buddha, ease and joy are elements of enlightenment. In life, there’s a lot of suffering. Why do you have to suffer more practicing Buddhism? You practice Buddhism in order to suffer less, right? The Buddha is a happy person. When the Buddha sits, he sits happily, and when he walks, he walks happily. Why do I want to do it differently from the Buddha? Maybe people are afraid that others might say, “You are not very serious in your practice. You smile, you laugh, you are having a good time. To practice seriously you have to be very grim, very serious.” Maybe the people who want to get more donations put it like that—to leave the impression they practice more seriously than other people. Take the practice of sitting all night. You aren’t allowed to rest and you think that is intensive practice, but you suffer all night and drink coffee in order to stay awake. That’s nonsense. It’s the quality of the sitting that can help you transform, not sitting a lot and suffering while you do. Sitting and walking meditation are for enjoying, and also for looking deeply and developing insight. That insight can liberate us from fear, anger, and despair. I really enjoyed the outdoor walking meditation we did on this retreat. Usually in the Buddhist tradition, you sit, and then you stand up and do slow walking in the meditation hall, and then you sit again. We don’t do that here. Instead, we do outdoor walking. That practice is helpful because you can apply it in your daily life. You walk normally—not too slowly—so you don’t look like you’re practicing and people see you as normal. And then when you go home, when you’re going from the parking lot to your office, you can enjoy walking. The basic practice is how to enjoy—how to enjoy walking and sitting and eating and showering. It’s possible to enjoy every one, but our society is organized in such a way that we don’t have time to enjoy. We have to do everything too quickly. What do you think makes someone a Buddhist? A person may not be called a Buddhist, but he can be more Buddhist than a person who is. Buddhism is made of mindfulness, concentration, and insight. If you have these things, you are a Buddhist. If you don’t, you aren’t a Buddhist. When you look at a person and you see that she is mindful, she is compassionate, she is understanding, and she has insight, then you know that she is a Buddhist. But even if she’s a nun and she does not have these energies and qualities, she has only the appearance of a Buddhist, not the content of a Buddhist. Can a ceremony make someone a Buddhist? No, it’s not by ceremony that you become a Buddhist. It is by committing to practice. Buddhists get caught in a lot of rituals and ceremonies, but the Buddha does not like that. In the sutras, specifically in the teaching given by the Buddha right after his enlightenment, he said that we should be free from rituals. You do not get enlightenment or liberation just because you perform rituals, but people have made Buddhism heavily ritualistic. We are not nice to the Buddha. What can we do about the high level of materialism in our culture? You can set up an environment where people live simply and happily, and invite others to come and observe. That is the only thing that will convince them to abandon their materialistic idea of happiness. They think that only when you have a lot to consume can you be happy, but many are very rich without being happy at all. And there are those who consume much less, but who are happier. We need to demonstrate that living simply with a practice of the dharma can be very fulfilling, because until people see it and experience it, they cannot be convinced. In Plum Village, we laugh all day long, yet not one of us has a private bank account. Not one of us has a private car or a private telephone. We only eat vegetarian food. But we don’t suffer because we don’t eat eggs or meat. In fact, we are happier because we know that we are not eating living beings and we are protecting the planet. That brings a lot of joy. We are fortunate to be able to live like that, to eat like that. There is a belief that unless you have a lot of money, unless you hold a high position in society, you cannot be truly happy. It is hard to let go of that belief until you see the truth that happiness is possible in another way. Seeing that will make the future possible for our children. So I think in Buddhist circles we have to reorganize so that we can show people a way of living happily based on mutual understanding, not materialism. Just a dharma talk isn’t enough, because a dharma talk is just a talk. Only when people see such an unmaterialistic community, when they see such a way of life, will they be convinced. Lion’s Roar is independent, unbiased, not-for-profit, and supported by readers like you. Please donate today and help the lion’s roar echo for readers around the world. for the Lunar New Year. Entrevista exclusiva de Andrea Millar con Thich Nhat Hanh. Es muy doloroso cuando personas a quienes amamos tienen serias dificultades, tales como una enfermedad mental, estrés postraumático o adicción. A veces se siente como si sus problemas fueran tan grandes que uno no puede verdaderamente ayudarlos y entonces uno quiere alejarse de ellos y sus problemas. En otros casos, intentamos ayudar y entonces acabamos consumidos por las luchas de la otra persona. ¿Qué podemos hacer para ayudar en estas situaciones difíciles sin que seamos agobiados? Cuando te sientes agobiada, estás intentando demasiado fuerte. Ese tipo de energía no ayuda a la otra persona y no te ayuda a ti. No debes ser muy impaciente por ayudar de la manera correcta. Hay dos cosas: ser y hacer. No pienses demasiado en hacer —ser es lo primero. Ser paz. Ser alegría. Ser felicidad. Y luego hacer alegría, hacer felicidad, sobre la base de ser. De modo que primero debes enfocarte en la práctica de ser. Ser lozana. Ser pacífica. Ser atenta. Ser generosa. Ser compasiva. Esta es la práctica básica. Es como si la otra persona estuviera sentada junto a un árbol. El árbol no hace nada, pero el árbol está lozano y vivo. Cuando eres como ese árbol, irradiando oleadas de frescor, ayudas a calmar el sufrimiento en la otra persona. Tu presencia debe ser placentera, debe ser calmada, y debes estar cerca de él o ella. Eso es ya bastante. Cuando a los niños les gusta venir y sentarse cerca de ti, no es porque tengas un montón de galletitas para darles, sino porque sentarse cerca de ti es agradable, es refrescante. Así que siéntate cerca de la persona que sufre y trata cuanto puedas de ser todo lo mejor: complaciente, atenta, fresca. Si estoy sintiendo una emoción muy difícil, tal vez ira o prodfunda tristeza, y trato de enfocarme en mi respiración, ¿no es esa una forma de evadir mis emociones? Comúnmente las personas se pierden en una emoción fuerte y quedan agobiados. Esa no es la forma de tratar la emoción, porque cuando eso sucede eres una víctima de la emoción. Para no ser víctima de la emocion, respira y mantén tu calma, y vas a experimentar la percepción de que una emoción es solo una emoción, nada más. Esta apreciación es muy importante, porque entonces ya no tendrás miedo. Estarás calmada, no estarás intentando escaparte, y puedes arreglártelas mejor con la emoción. Tu respiración eres tú y necesitas aliarte con tu respiración para ser más tú misma, para ser más fuerte. Luego puedes manejar tu emoción mejor. No tratas de olvidar tu emoción; en su lugar, tratas de ser más tú misma, de modo que eres lo suficientemente fuerte para lidiar con tu emoción. Era muy reconfortante ver tantos niños en el retiro. Me siento muy a gusto con los niños. Nunca me he separado de la generación más joven. Bien sean monásticos o laicos, la comunicación siempre está abierta con la más joven generación. Ese es uno de los elementos de mi felicidad. A veces las madres jóvenes traen a sus hijos al salón de meditación porque no quieren perder la charla dharma (religiosa). Eso es muy fructífero para todos. Los bebés no saben lo que está sucediendo, pero sienten la atmósfera de paz. Esa energía de paz es my rara en la sociedad: es muy raro tener a mil quinientas personas sentadas y generando conciencia y paz. Si brindas a los niños una imagen de paz y amor, aun cuando sean muy jóvenes y todavía no entiendan el lenguaje, eso no quiere decir que no lo sientan. Trata de imaginar a una joven madre dándole el pecho a su niño durante el retiro. Está escuchando el dharma, está interiorizando el dharma y el bebé está sorbiendo tanto la leche como el dharma a la vez. Es muy hermoso. Más adelante, cuando los niños enfrenten la crueldad del mundo, recordarán que hubo un tiempo en que tuvieron la oportunidad de encontrar la energía de la paz. Cuando una sangha, una comunidad budista, se reúne y practica, puede siempre generar ese tipo de energía pacífica y los jóvenes pueden experimentarla y empezar a sembrar las semillas para el futuro. El budismo comprometido trata de llevar esa energía pacífica a muchas situaciones diferentes. En escuelas, en hospitales, en ayuntamientos, en el congreso, la práctica de la respiración consciente es posible. ¿La vida en el momento presente está en desacuerdo con el disfrute de los medios? ¿Podemos ser conscientes y aun así disfrutar de Internet, la televisión, las películas y los libros? Hay buenos libros y películas que puedes disfrutar. Eso está bien: es bueno disfrutarlos. Pero a veces la calidad del filme o del libro no es nada buena, aun así no lo apartas porque de hacerlo, tendrás que volver atrás y experimentar el sufrimiento dentro de ti. Esa es la práctica de muchas personas en nuestra sociedad. Muchas personas no pueden estar consigo mismas. Sienten dolor, tristeza o preocupaciones dentro y leen o ven o escuchan para ocultar eso, para huir de ellos mismos. Consumir los medios así es solo evadirse y eso no tiene un efecto duradero. Puedes olvidar tu sufrimiento por algún tiempo, pero al final tendrás que volver a ti misma. El Buda recomendaba que no debíamos intentar escapar de nosotros mismos, sino cuidar mucho de nosotros mismos y transformar nuestro sufrimiento. ¿Qué le diría a alguien que halla el sentarse a meditar doloroso y dificil y se esfuerza por hacerlo? Sí, sí. Si no hallas placentero sentarte a meditar, no te sientes. Tienes que aprender el espiritu correcto de sentarte. Si haces mucho esfuerzo al sentarte, te pones tenso y eso crea dolor por todo el cuerpo. Sentarse debe ser agradable. Cuando enciendes la televisión en tu sala, puedes sentarte durante horas sin sufrir. Sin embargo cuando te sientas a meditar, sufres. ¿Por qué? Porque te esfuerzas. Quieres tener éxito en tu meditación y entonces luchas. Cuando ves la televisión no luchas. Tienes que aprender a cómo sentarte sin luchar. Si sabes cómo sentarse de tal modo, sentarse es placentero. Cuando Nelson Mandela visitó Francia una vez, un periodista le preguntó qué era lo que más le gustaba hacer. Contestó que como andaba tan ocupado, lo que más le gustaba hacer era sentarse y no hacer nada. Porque sentarse y no hacer nada es un placer: te restableces. Es por eso que el Buda lo describía como sentarse sobre una flor de loto. Cuando estás sentado, te sientes ligera, te sientes fresca, te sientes libre. Y si no te sientes así al sentarte, entonces sentarse se ha convertido en una suerte de tarea difícil. A veces si no tienes suficiente sueño o tienes una gripe u otra cosa, quizás sentarse no sea todo lo placentero que desearías. Pero si te sientes normal, experimentar el placer de sentarte es siempre posible. El problema no es sentarse o no sentarse, sino cómo sentarse. Cómo sentarte de manera que puedas sacar lo mejor de ello, de otro modo estás perdiendo tu tiempo. Usted pone mucho más énfasis en el disfrute —disfrutar la respiración, el sentarse, el caminar, disfrutar la vida en su conjunto— que muchos otros maestros budistas. En las enseñanzas de Buda, la comodidad y la alegría son elementos de la iluminación. En la vida, hay mucho sufrimiento. ¿Por qué tienes que sufrir más practicando el budismo? Practicas el budismo para sufrir menos, ¿no es así? El Buda es una persona feliz. Cuando el Buda se sienta, lo hace alegremente, y cuando camina, camina felizmente. ¿Por qué voy a querer hacerlo diferente del Buda? Tal vez la gente sienta miedo de que los otros digan: “No eres muy serio en tu práctica. Te sonríes, te ríes, la pasas bien. Para practicar seriamente debes estar adusto, muy solemne.” Quizás la gente que quiere conseguir más donaciones lo exponen de tal modo, para dejar la impresión de que lo pratican más seriamente que otras personas. Vea la práctica de sentarse toda la noche. No le está permitido descansar y piensa que es una práctica intensiva, pero sufre durante toda la noche y bebe café para mantenerse despierta. Eso no tiene sentido. Es la manera de sentarse la que puede ayudar a transformarte, no el sentarte mucho y sufrir mientras lo haces. Sentarse o caminar para meditar son para disfrutar y también para mirar profundamente y desarrollar percepción. Esa percepción puede liberarnos del miedo, la furia y el desespero. En realidad disfruté la caminata al aire libre de meditación que hicimos en este retiro. Usualmente, en la tradición budista, te sientas y luego te pones de pie y haces una lenta caminata en el salón de meditacion y luego te vuelves a sentar. Nosotros no lo hacemos así aquí. En su lugar, caminamos al aire libre. Esa práctica es útil porque la puedes aplicar en tu vida diaria. Caminas normalmente —no muy lento— de modo que no pareces que estés practicando y la gente te ve como normal. Y entonces cuando vuelves a casa, cuando vas del parqueo a tu oficina, puedes disfrutar caminar. La práctica básica es cómo disfrutar: cómo disfrutar caminar y sentarse y comer y ducharse. Es posible disfrutar cada uno de ellos, pero nuestra sociedad está organizada de tal modo que no tenemos tiempo para disfrutar. Tenemos que hacer todo demasiado rápido. ¿Qué usted cree que hace de una persona un budista? Una persona puede no ser llamada budista, pero puede ser más budista que alguien a quien se llama así. El budismo lo hace la conciencia, la concentración, la percepción. Si posees estas cosas, eres un budista. Si no lo tienes, no eres un budista. Cuando miras a una persona y ves que ella es consciente, es compasiva, es comprensiva, y que tiene percepción, entonces sabes que es un budista. Pero aun si es una monja y no tiene esas energías y cualidades, solo tiene la apariencia de un budista, no la esencia de un budista. ¿Puede una ceremonia hacer de alguien un budista? No, no es por una ceremonia que te conviertes en budista. Es por consagrarte a la práctica. Los budistas se dejan atrapar en un montón de rituales y ceremonias, pero al Buda no le gusta eso. En los sutras, particularmente en la enseñanza que dio el Buda después de su iluminación, dijo que debíamos liberarnos de rituales. No alcanzas la iluminación o la liberación solo porque realizas rituales, pero la gente ha convertido al budismo en altamente ritualista. No somos amables con el Buda. ¿Tienes que creer en le reencarnación para ser budista? La reencarnación quiere decir que hay un alma que sale de tu cuerpo y entra en otro cuerpo. Eso es muy popular, una muy errónea nocion de la continuidad en el budismo. Si piensas que hay un alma, un ser, que habita en un cuerpo y que sale cuando el cuerpo se desintegra y toma otra forma, eso no es budismo. Cuando miras en una persona, ves cinco skandhas o elementos: la forma, el sentimiento, las percepciones, las estructuras mentales y la conciencia. No hay ninguna alma, ningún ser fuera de esos cinco, de modo que cuando los cinco elementos entran en disolución, el karma, las acciones, que has realizado durante tu vida es tu continuación. Lo que has hecho y pensado está todavía ahí como energía. No necesitas un alma o un ser para continuar. “Eres más que solo este cuerpo porque los cinco skandhas siempre están produciendo energía”. Es como una nube. Incluso cuando la nube no está ahí, siempre sigue estando en forma de nieve o lluvia. La nube no necesita tener un alma para continuar. No hay principio ni fin. No tienes que esperar hasta la total desintegración del cuerpo para continuar: tú continúas en cada momento. Supón que yo transmita mi energía a cientos de personas; entonces ellos me dan continuidad. Si los miras y me ves, bueno, me has visto. Si piensas que soy solo esto [se señala a sí mismo], entonces no me has visto. Pero cuando me ves en mis palabras y en mis actos, ves que ellos me dan continuidad. Cuando miras a mis discípulos, mis estudiantes, mis libros y mis amigos, ves mi continuidad. Nunca moriré. Hay una disolución de este cuerpo, pero eso no implica mi muerte. Yo continúo, siempre. Eso es verdad para todos nosotros. Tú eres más que solo ese cuerpo porque los cinco skandhas están siempre produciendo energía. Eso se llama karma o acción. Pero no hay agente: no necesitas un agente. La acción es suficientemente buena. Esto puede comprenderse en términos de física cuántica. La masa y la energía, la fuerza y la materia: no son cosas separadas. Son lo mismo. ¿Qué podemos hacer respecto al alto nivel de materialismo en nuestra cultura? Puedes establecer un ambiente donde la gente viva sencilla y felizmente e invitar a otros a venir y mirar. Esa es la única cosa que los convencerá de abandonar su idea materialista de la felicidad. Ellos piensan que solo cuando tienes bastante para consumir puedes ser feliz, sin embargo muchos son muy ricos sin ser felices para nada. Y están los que consumen mucho menos, pero son más felices. Necesiamos demostrar que vivir sencillamente con la práctica del dharma puede ser muy satisfactorio, porque hasta que la gente no lo vea y lo experimente, no estará convencida. En Plum Village nos pasamos el día riendo, sin embargo ninguno de nosotros tiene una cuenta de banco. Ninguno tiene un auto particular o un teléfono privado. Solo consumimos alimentos vegetarianos. Pero no sufrimos porque no comamos huevos o carne. De hecho, somos más felices porque sabemos que no estamos comiéndonos seres vivos y estamos protegiendo el planeta. Eso trae mucha alegría. Somos afortunados de ser capaces de vivir de ese modo, de comer así. Existe la creencia de que, a menos de que tengas un montón de dinero, a menos que ocupes una alta posición en la sociedad, no puedes ser verdaderamente feliz. Es difícil desprenderse de esa creencia hasta que compruebes la verdad de que la felicidad es posible de otra manera. Ver eso hará que el futuro sea posible para nuestros hijos. De modo que pienso que en los círculos budistas tenemos que reorganizarnos de manera que podamos mostrar a la gente una forma de vivir felizmente sobre la base del entendimiento mutuo, no del materialismo. Solo una charla de dharma no es suficiente, porque una charla de dharma es solo hablar. Únicamente cuando la gente vea tal comunidad no materialista, cuando vea tal forma de vida, se convencerá. GRACIAS POR LEER “LION´S ROAR”. ¿PODEMOS AHORA SOLICITARLE SU AYUDA?